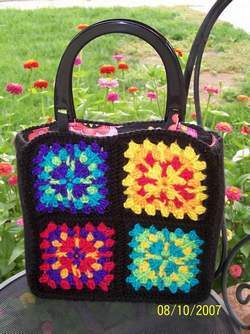 The Granny Square Pucker Purse is a twist on an old favorite. 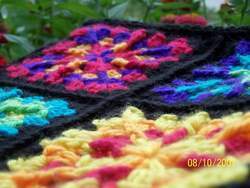 Made up of two panels of four vibrantly colored granny squares, this bag is not only eye popping and mouth watering but extremely easy even for a novice crocheter. The inspiration for this purse came from a pattern book I own Knit & Crochet Inspirations: Autumn Collection 2005 by Lion Brand Yarns and Hobby Lobby. 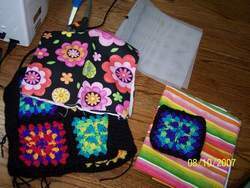 The Granny Square Afghan in this book uses a granny square block similar to the one I use for this purse. In this purse, the granny squares have stitches that are worked with a long double crochet into the row below making a very nice textured stitch...that is the twist I was talking about. By using the vibrant colors together with the long double crochet it makes each round of the Granny Square Pucker Purse really blend together. For even more textureI joined or seamed the squares together on the public side of the work. Therefore, the seams are not hidden but part of the over all look of the purse. This makes the purse very visually appealing as well as uniquely appealing to your touch sensory. Finish off this purse with a fabric lining, plastic canvas and some great handles to make YOUR Granny Square Pucker Purse really unique. You ready to make your own Granny Square Pucker Purse? 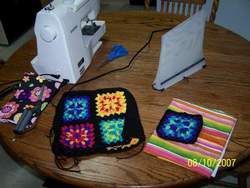 NoteAs long as each square is even and both panels are even you will be okay to make the Granny Square Pucker Purse a little larger or smaller. Long Double Crochet (LDC)YO once, insert hook in stitch or space or post indicated, YO and pull up a loop. Bring your hook (stretching the loop you just pulled through) back up to the row you started. YO and pull through 2 loops, YO pull through 2 loops. Just as you would a regular double crochet (DC). For which color to use please refer to the color sequence list above. With first color, CH 4 and join to first ch with a SL ST to form a ring. Round 1 (CH 3 [counts as first double crochet now and throughout], 2 DC in ring, CH 1). *(3 DC, CH 1) in ring three times. Join with a SL ST to the top of the first ch 3. Finish Off. Round 2 with second color join yarn with a SL ST to any ch 1 space. (CH 3, 2 DC, 1 LDC in ring below, 3 DC, CH 1) in same space. *3 DC, 1 LDC in ring below, 3 DC, CH 1* in each ch 1 space around. Join with a SL ST to top of first ch 3. Finish Off. Round 3 with third color join yarn with a SL ST to any ldc stitch. (CH 3, 2 DC, CH 1, 3 DC, CH 1) in same stitch [this is starting the corner of your square]. *Skip next 3 dc, in ch 1 space (1 DC, 1 LDC around the post of the center dc of the 3 dc set of round 1, 1 DC, CH 1). (3 DC, CH1, 3 DC, CH 1) in next LDC. Repeat from * two more times. Skip next 3 dc, in ch 1 space (1 DC, 1 LDC around the post of the center dc of the 3 dc set of round 1, 1 DC, CH 1). Joint with a SL ST to top of first ch 3. Finish Off. Round 4 with the first color join with a SL ST to any corner ch 1 space. In same space (CH 3, 2 DC, LDC around post of LDC on round 2, 3 DC, CH 1). *Skip next 3 dc, in ch 1 space (3 DC, CH 1) two times. In corner ch 1 space (3 DC, LDC around post of LDC on round 2, 3 DC, CH 1). Repeat from * two more times. Skip next 3 dc, in next two ch 1 spaces (3 DC, CH 1). Join with a SL ST to the top of first ch 3. Finish Off. Round 5 with second color join yarn with a SL ST to any LDC. In same stitch (CH 3, 2 DC, CH 1, 3 DC, CH 1) *Skip next 3 dc, (3 DC, CH 1) in ch1 space, (1 DC, LDC around post of ldc of round 3, 1 DC, CH 1) in next ch 1 space. Skip next 3 dc, (3 DC, CH 1) in ch 1 space, (3 DC, CH 1, 3 DC, CH 1) in next LDC stitch. Repeat from * two more times. Skip next 3 dc, (3 DC, CH 1) in ch 1 space, (1 DC, LDC around post of ldc of round 3, 1 DC, CH 1) in next ch 1 space. Skip next 3 dc, (3 DC, CH 1) in ch 1 space. Join with a SL ST to the top of first ch 3. Finish Off. Round 6 with Black join yarn with a SL ST to any corner ch 1 space. In same stitch (CH 3, 2 DC, CH 1, 3 DC, CH 1). *Skip next 3 dc set, (3 DC, CH 1) in ch 1 space; four times. (3 DC, CH 1, 3 DC, CH 1) in corner space. Repeat from * two more times. Skip next 3 dc set, (3 DC, CH 1) in ch 1 space; four times. Join with a SL ST to the top of first ch 3. Finish Off. Complete two of each color sequence and you are one your way to finishing the Granny Square Pucker Purse! The sides and bottom are worked in one long strip of SC. The amount of rows is dependent on your guage. Make the strip long enough to reach from the top corner of the panel, down the side, along the bottom, up the other side to the other top corner of the panel. SC in first sc space and in each sc across. CH 1 and turn. Repeat until desired length. Approx. 33 inches or 138 rows. Little Tip Don't finish off the long strip until it is already slip stitch seamed to the granny square panels. If you seam the strip to the panels starting with the chain row and work your way toward the other end of your strip that is not finished off you leave yourself room for adding more rows or pulling out rows without much effort. Put the Granny Square Pucker Purse together! With NON-PUBLIC sides together and working through both loops, SL ST join or seam the blocks together. The suggested placement diagram for the blocks is listed at the top of this pattern after the color sequence. Note: By seaming it up in this manner it WILL put your seams on the PUBLIC side of your purse which is exactly what you want. Again, as I said in the beginning, this purse is meant to have a LOT of texture with the LDC and the seaming on the outside of the bag. After the blocks have been joined or seamed together and you now have a panel. SC around the entire panel making sure to put 3 SC in each of the four corners. 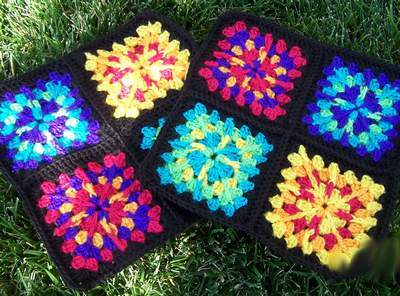 You will make two panels of four granny squares. When the panels are complete take the long strip you made for the sides and bottom and place the NON-PUBLIC side of both panel and the strip together. Starting at the MIDDLE SINGLE CROCHET OF THE TOP CORNER of the bag, SL ST join or seam them together. After you have one panel seamed to the strip, take the other panel and line it up to the strip making sure that the sides of the granny squares are all lined up across it (you don't want one square higher than another). Pin the pieces together at this point to make sure everything is where I want it to be before seaming it up. Little Tip When pinning I like to use my daughters hair clips to "pin" the pieces together. I don't know what it is but using these little hair clips work better for me than using straight pins. I think it is because of the bulk and size of the hair clips make it easy to see. Really, try it! You are going to love it! Okay, now that you have it all lined up start at the SAME MIDDLE SINGLE CROCHET AT THE TOP CORNER of the bag OPPOSITE SIDE, SL ST join or seam the two pieces together. The Granny Square Pucker Purse wouldn't be the GRANNY SQUARE PUCKER PURSE without the eye catching lining! Take the time to do this little extra touch and your Granny Square Pucker Purse will be unforgettable! I wanted to make the bag sturdy enough to stand up on its own. Because a crochet bag all by itself can't do this I added Plastic Canvas to the inside of the bag between the lining and the granny squares. The lining is just some fabric I got at my local fabric store. I thought it was really cool and made the inside of the bag pop. Even though it is black the inside of the bag is not too dark because of the bright flowers on the fabric. For the lining I just cut a piece of fabric 25" long by 12.5 inches wide. Pin the pieces together and stuff it inside your purse to see if it is a good fit. Adjust it if needed but it it is okay sew up the side seams. (I am trying to make this as easy as possible for those crocheters who don't sew). Again, put the lining inside the bag and folded the tip edge of the fabric down just below the top of the inside edge of the bag and use straight pins to hold the fabric in place (do not pin to the bag at this time). 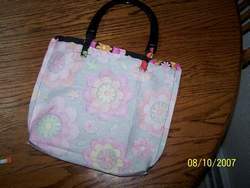 Once every thing is pined in place, pull the lining out of the bag and sew the fold you just created. At this point you can also add an interior pocket to the lining. Little Tip I had made one extra granny square and added it to the lining to use as a pocket. You could also use some contrasting fabric to make the pocket visually appealing. Just a thought. At this point you need to decide what kind of handles you want to use and if you need to stitch them to the lining or the purse itself before the lining it stitched in place or if you want the handles attached on the outside of the lining after it is stitched to the purse. LOTS of decisions :-) Have fun with it! Mine are a pair of plastic handles I purchased as my local fabric store. I attached them to the lining of the bag before I stitched the lining to the granny square panels and side of the purse. When you are ready, put the plastic canvas in the purse (don't forget to add it to the bottom as well as the sides) then place the lining inside the bag and use a needle and thread to backstitch the lining to the purse. 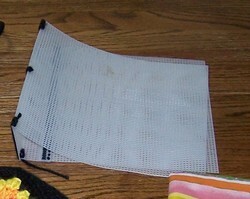 Note Don't worry about doing anything more to the plastic canvas as it will be held in place by the lining and the purse. Voila, you have a completed the Granny Square Pucker Purse! 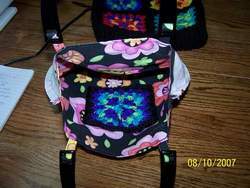 I really hope you enjoy making the Granny Square Pucker Purse. Let us know if you have any questions and be sure to show us pictures of your Granny Square Pucker Purse!